An interactive session between Heather (a Boston Marathon bombing survivor and below knee amputee) and Aaron (while helping changing a tire - survived a car accident resulting in the loss of both legs above the knee) sharing their stories and describing how technology and society help and hinder their daily functionality. 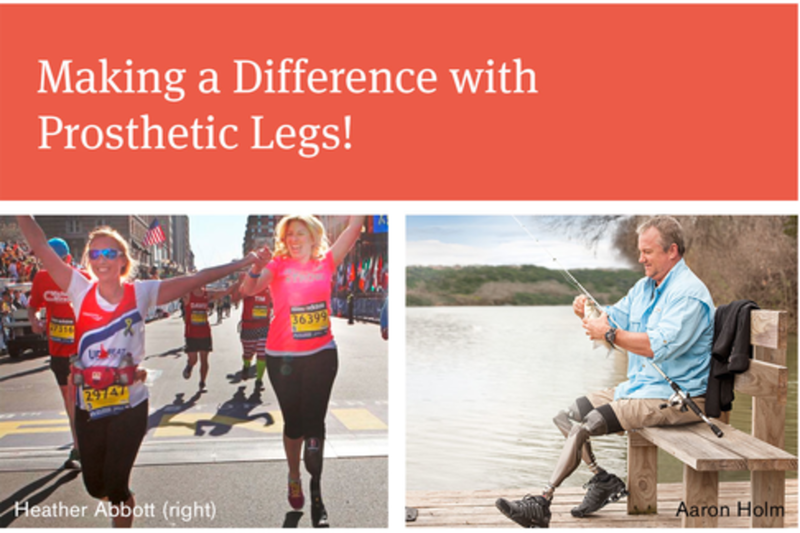 Heather and Aaron will discuss and demonstrate how their needs and wants differ in functionality and cosmetics but their drive to make the world a better place for those with limb loss is aligned and compelling to all. Aaron Holm lost both of his legs in a horrific accident on January 2, 2007. But what shattered his body failed to dent his courage, strength and infectious optimism. In 2008 Aaron started the non-profit organization www.wiggleyourtoes.org - with a mission to help those who have suffered limb loss heal, recover and flourish! He’s been helping others regain their positive energy and spirit ever since. On April 15, 2013, what is referred to as Marathon Monday in Boston, Heather Abbott of Newport, RI was struck by shrapnel from the second of the two bombs, which severely injured her left foot. She was faced with the agonizing decision of whether to try to save her left foot or to allow doctors to amputate her left leg below the knee. With the help of other amputees and the support from hundreds of thousands around the country, Heather made the difficult decision to live her remaining years as an amputee and use prosthetic legs. Just four months following the bombing, she was living independently and returned to her job as a Human Resources Manager. Within the first year following her amputation, she started participating in the activities she loves, including paddle boarding, running and wearing high heels. She has become certified as a Peer Counselor by the American Amputee Coalition and is helping other amputees adjust to their “new normal,” as an example of hope and determination. In addition, she is founder of the Heather Abbott Foundation, which provides prosthetic devices to limb loss victims of traumatic circumstances. Heather has remained a model of strength and resilience. Now a motivational speaker, she is sharing her story with audiences across the country and inspiring others with her contagious optimism and thoughtful reflection on her journey.